Warming and earlier spring increase western U.S. forest wildfire activity. Biomass burning is widespread, especially in the tropics. It serves to clear land for shifting cultivation, to convert forests to agricultural and pastoral lands, and to remove dry vegetation in order to promote agricultural productivity and the growth of higher yield grasses. Furthermore, much agricultural waste and fuel wood is being combusted, particularly in developing countries. Biomass containing 2 to 5 petagrams of carbon is burned annually (1 petagram = 10(15) grams), producing large amounts of trace gases and aerosol particles that play important roles in atmospheric chemistry and climate. Emissions of carbon monoxide and methane by biomass burning affect the oxidation efficiency of the atmosphere by reacting with hydroxyl radicals, and emissions of nitric oxide and hydrocarbons lead to high ozone concentrations in the tropics during the dry season. Large quantities of smoke particles are produced as well, and these can serve as cloud condensation nuclei. These particles may thus substantially influence cloud microphysical and optical properties, an effect that could have repercussions for the radiation budget and the hydrological cycle in the tropics. 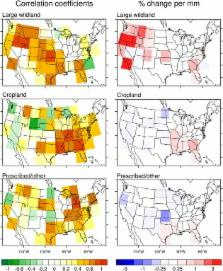 Widespread burning may also disturb biogeochemical cycles, especially that of nitrogen. About 50 percent of the nitrogen in the biomass fuel can be released as molecular nitrogen. This pyrdenitrification process causes a sizable loss of fixed nitrogen in tropical ecosystems, in the range of 10 to 20 teragrams per year (1 teragram = 10(12) grams). Copyright statement: ©2014. The Authors.